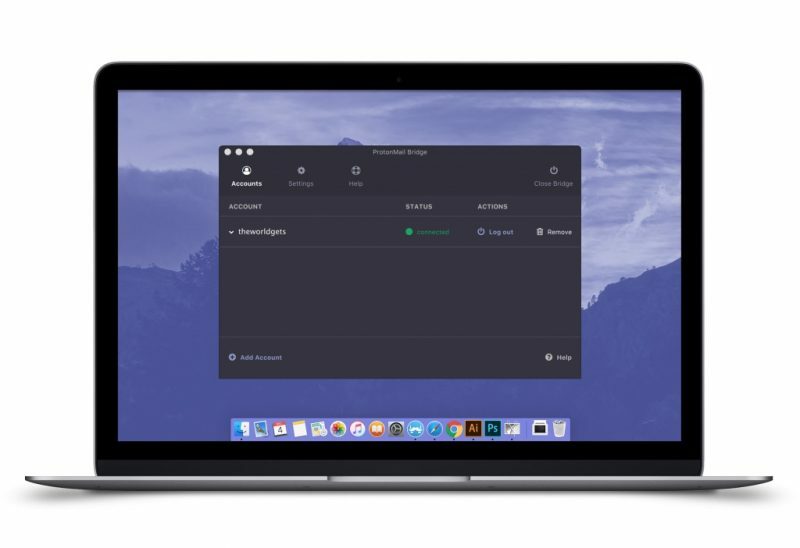 Swiss-based encrypted email provider ProtonMail today announced Bridge, an app for premium account holders that aims to bring easy-to-use email encryption to desktop email clients like Outlook, Thunderbird, and Apple Mail. One of our goals has always been to bring easy-to-use encrypted email to desktop. The problem is formidable. Desktop systems encompass multiple operating systems with dozens of popular email clients with their own adherents, and virtually none of them natively speak PGP, the email encryption standard upon which ProtonMail is built. Around two years ago, we created a small task force to tackle this challenge. Today, we are finally ready to present ProtonMail Bridge. Basically, the downloadable Bridge app enables ProtonMail users to access their encrypted email accounts using their favorite email client, without compromising on the security provided by the end-to-end encrypted service, and without needing to modify their email application. At the same time, local copies of the emails are stored on the user's computer, allowing them to use the search features of their email client as normal. To achieve this, the Bridge app functions like a local IMAP/SMTP email server capable of communicating with the remote ProtonMail server to encrypt and decrypt incoming/outgoing messages locally. In this way, it translates end-to-end encrypted email data into a language that any email client can understand, thus "bridging" the gap between ProtonMail's end-to-end encryption and a user's standard email client. The Bridge app aims to fit right into email clients with standard pre-existing multiple accounts, such as Gmail, enabling users to drag and drop emails into ProtonMail as encrypted versions. It's also possible to have multiple ProtonMail addresses and accounts in a single email client, and move messages between them. It's important to note that while the Bridge preserves end-to-end encryption, it does not protect emails at the end-point – a compromised laptop could still allow an attacker to read emails in the third-party client app, for example. Currently, the officially supported email clients are Thunderbird, Apple Mail, and Outlook. However, according to the developers, many other IMAP email clients were shown to work with the Bridge. ProtonMail Bridge is available for macOS to ProtonMail users with paid-for accounts, and can be downloaded here. The Bridge code is open source and will be released early next year. ProtonMail launched in March 2016, led by a group of scientists from CERN and MIT who aimed to deliver an easy-to-use end-to-end encrypted email service with freely available open source code. Earlier this year, the team launched a Tor-based site to make ProtonMail available to users in regions under the oppression of strict state online censorship, and also launched its own VPN service called ProtonVPN, which includes a free user tier in its pricing plan. My email use is mostly for shopping and bills and less so for private communications. I am more concerned about email company getting hacked and advertising than government monitoring. Most people now use texting for private communication. Another thing to consider is that email provider is like your phone number. Changing either one is pain, a real pain. It took me 3 years to close my Gmail account. You want to make sure you stay with provider that has been around for awhile. Cool. Free tier is fairly usable at 500MB storage and 150 messages per day, and Plus is only $48/year for 5GB storage, 1000 messages per day, and custom domain (unlimited is $75/year). Have been getting the family to use these guys for family e-mail since it has privacy - via their app and web interface. I can use my local e-mail client for this now, love it! These guys rock.